Now here's an odd little item. 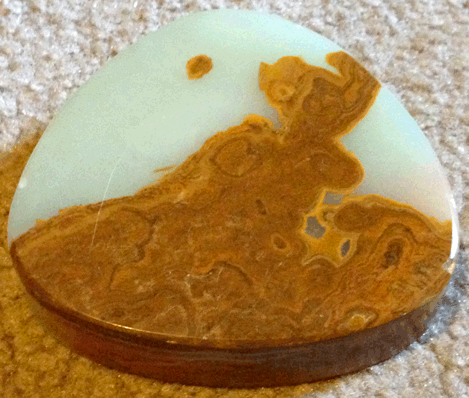 This is a glass paper weight with a wooden base. 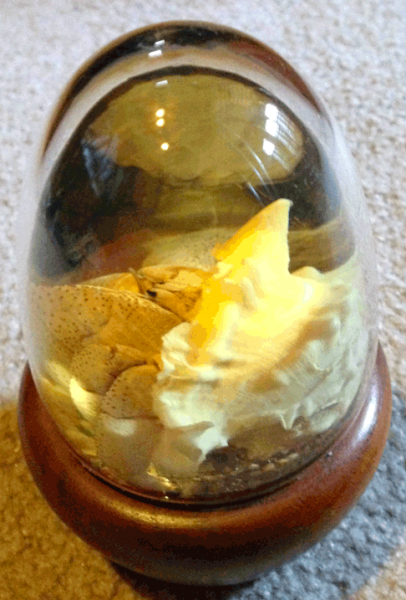 Inside is a real hermit crab in a shell that looks to have a few barnacles on it. It sits atop some naturally colored gravel. 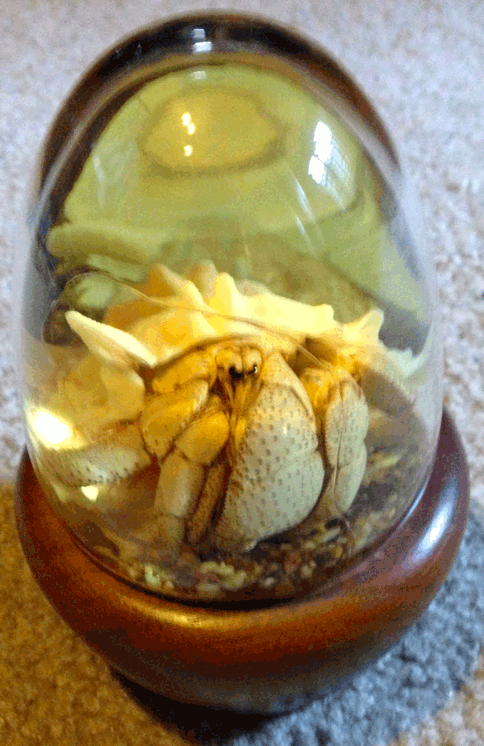 The hermit crab is encased in a jelly-like sustance that moves and jiggles, and gives the piece an odd feel when you hold it. The gel shifts, and there is an air bubble in it that shifts about as well and will actually disappear if you jiggle it a bit. The gel has yellowed a bit with age. 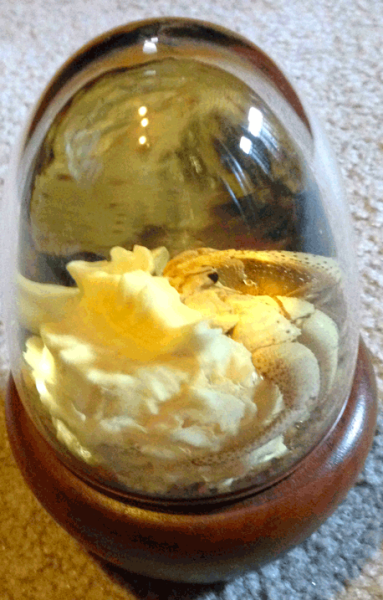 Your mounted hermit crab was created by the newest innovation in natural embedments. 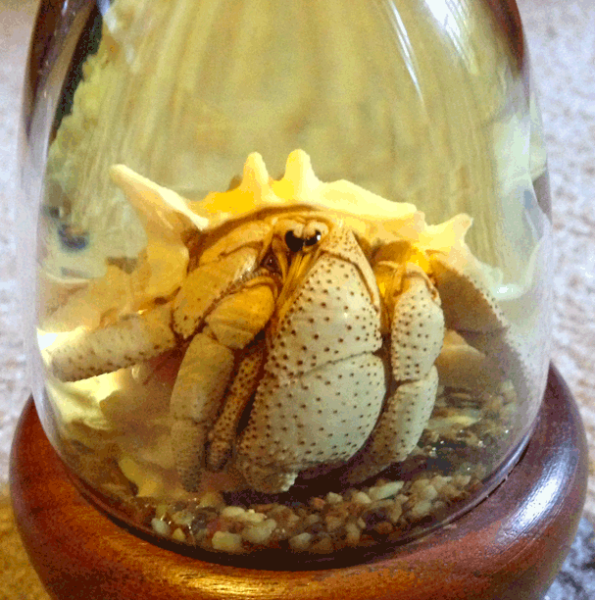 Found on virtually every coast in the world, the Hermit Cab is a curious creature. Having no protective shell of his own he continually moves into cast off shells to accomate his increasing size. For continued beauty and luster, avoid exposure to extreme temperature and direct sunlight. The surface is subject to breakage. Dropping or undue jarring may cause delamination and bubble formation. Contents may be hazardous if consumed. Mfg by Iminac, Inc., Lake Jackson, Texas. It stands about 5 inches tall and 3.5 inches wide. It weighs 1 lb, 2 ounces. The piece is not dated, but it is at least 35 years old. 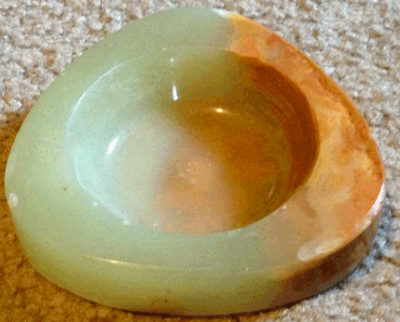 This marble coin dish has also been in the family for over 35 years. It was used as on office paper weight. It has dings along the edges that can be seen in the photos. It's a small dish - appx 3.5 inches wide and 0.5 inches deep. It weighs 9.2 ounces.